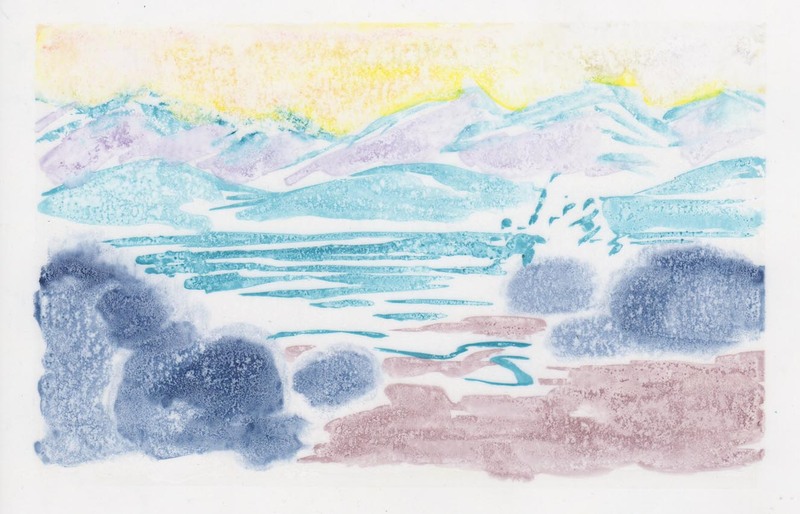 Yesterday I posted a couple of images of watercolour monotypes. Today I’m going to talk about how to make them. 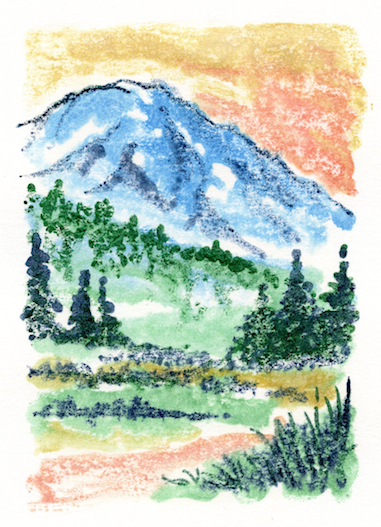 A very small monotype, about 3×4 inches. Most of the images in this post are about 5×7 inches. 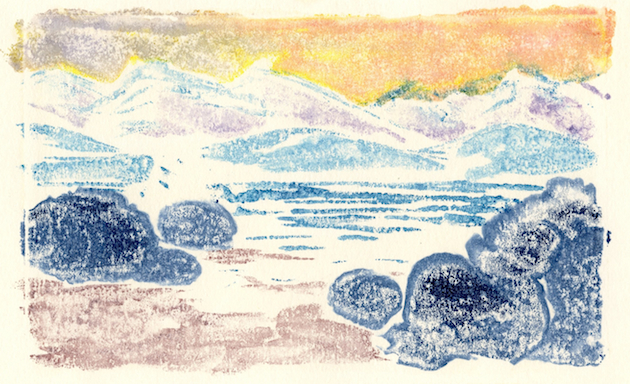 A monotype is a type of monoprint, which is a one-of-a-kind print. A print is an image that is produced by being transferred from one surface to another. A monotype is a print that is created on a plate or block without the structure of a carved or etched image; in other words, it is painted directly on the plate, then transferred to paper for the final image. Why make a print that cannot be repeated? Why not just paint on the paper? Monotypes create textures and effects that can be achieved in no other way. Although at first the technique is a bit hard to control, it is no more so than painting with watercolour. If you like the painterly look and the looseness and freedom of brushstrokes, and can handle the surprises, it can quickly become addictive. 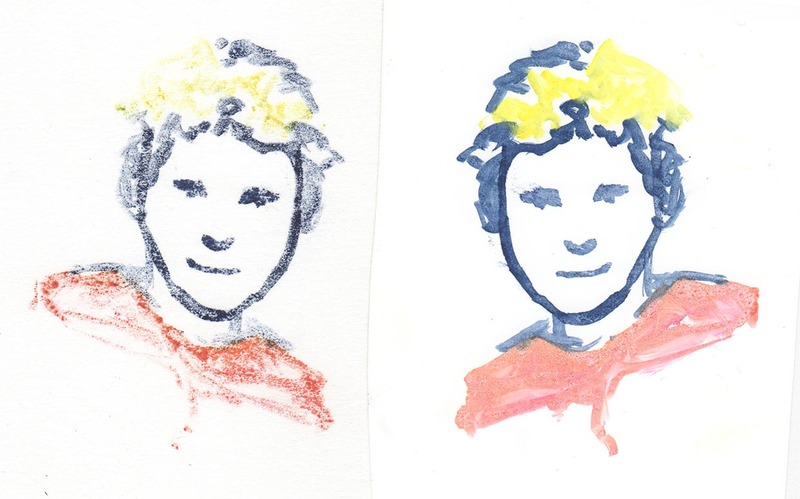 One thing that is easier to control with a monotype than direct painting is the choice of where to put your colour. 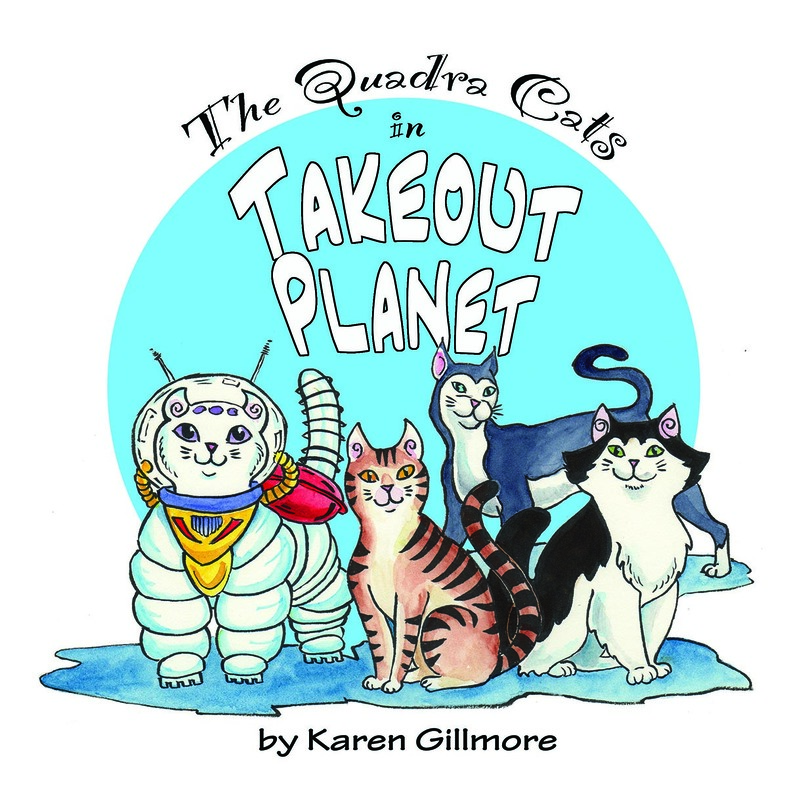 If you don’t like it on the plate, you can wipe it off, and try again before you commit yourself to printing it. You can layer colours, and keep working into an image little by little, building it up incrementally. You can also subtract areas of colour by wiping or scraping it clean. The rest of the stuff you will need! I forgot to put in my old wooden spoon that I use for applying pressure, but really, I usually rub with my fingers anyway. You can use any kind of watercolour paints, tube or dried. I use a couple of favourite materials for my plates: Yupo, a polypropylene based synthetic paper; and frosted mylar, a strong polyester film, coated with gum arabic, (the basic medium of watercolour, without the pigment). You should be able to find all of these materials, or similar, in an art supply store. I usually use Rising Stonehenge paper, a fairly smooth printmaking paper. If you used watercolour paper, the bumps would make a textured print. It is important that the paper be fairly sturdy, because it has to take a lot of rubbing. I generally use dry paper with wet paint, you can also use damp paper on dried paint, which works better if you have a press to apply the pressure instead of just rubbing with your hands (or the back of a wooden spoon). 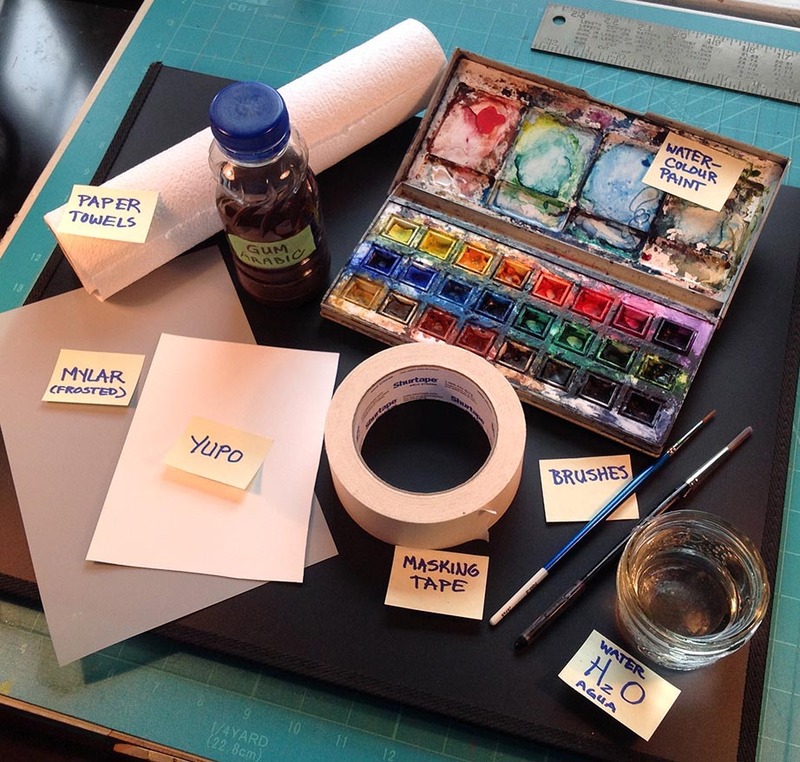 • Tape down the Yupo as you would a piece of watercolour paper, dry onto your painting board. • Lay a piece of your paper on top of the Yupo in the position you would like to have it, then tape down the top or a side edge. 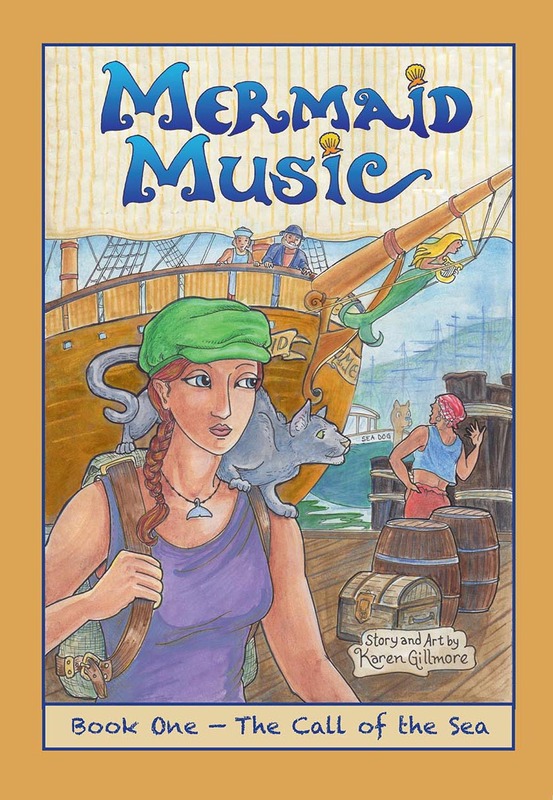 • Then flip the paper back out of the way. • Paint on the Yupo. Make a few experimental brushstrokes for the first time. The paint should be fairly saturated and thick in order to make a good transfer. • Flip the paper back over the Yupo, taking care not to wiggle it (the taping should prevent that). • Check the transfer by lifting up a corner. If necessary, rub some more. • Flip the paper back off the plate. • Paint some more, repeat steps until you are satisfied with your print. Be careful not to get mixed up as to which one you are painting on (been there, done that)! • You have created a monotype! For the mylar, I use a similar process, except that before painting on the plate, I coat it with gum arabic. This makes the paint stick to the plate a bit better, as well as serving as a releasing agent. With mylar, if you don’t coat it, the paint slides all around when you apply it, which can be interesting for blotchy effects, but is most annoying to control! Let the mylar dry, or the paint will be hard to control and will bleed — although this can create some interesting effects too! This shows how the tape is attached. The one on the left has the plate on top of the paper because it is smaller; the one on the right has the plate on the bottom because it is larger (and heavier, with the cardboard photo album page) then the paper. When they are open you just turn them so that you can work on the plate, so it doesn’t really matter which one is on top. Here are the same two prints in progress, opened up. The Yupo plate is at the top left, and the mylar plate at bottom right. 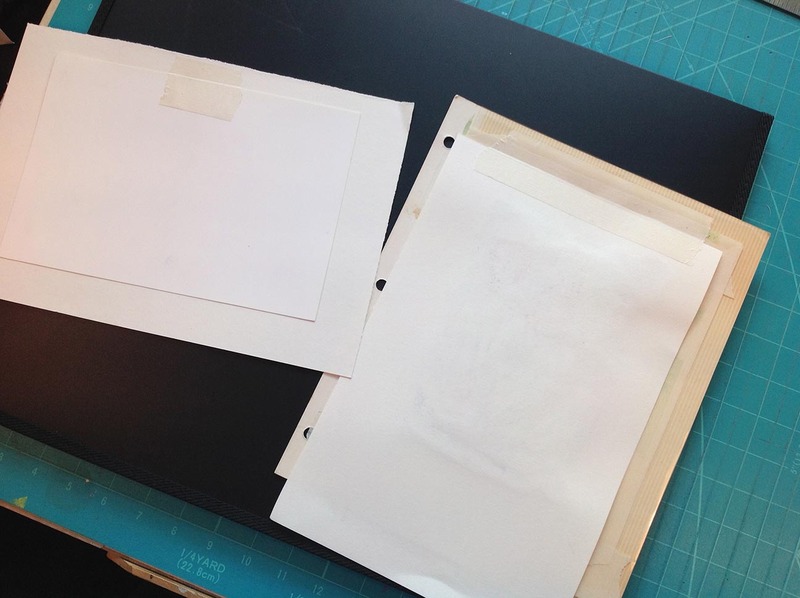 The mylar is taped to an old “magnetic” photo album page — these are perfect for small prints because they have the stiff cardboard inside a plastic sleeve, which can be wiped off between printing if any stray paint gets out of bounds. 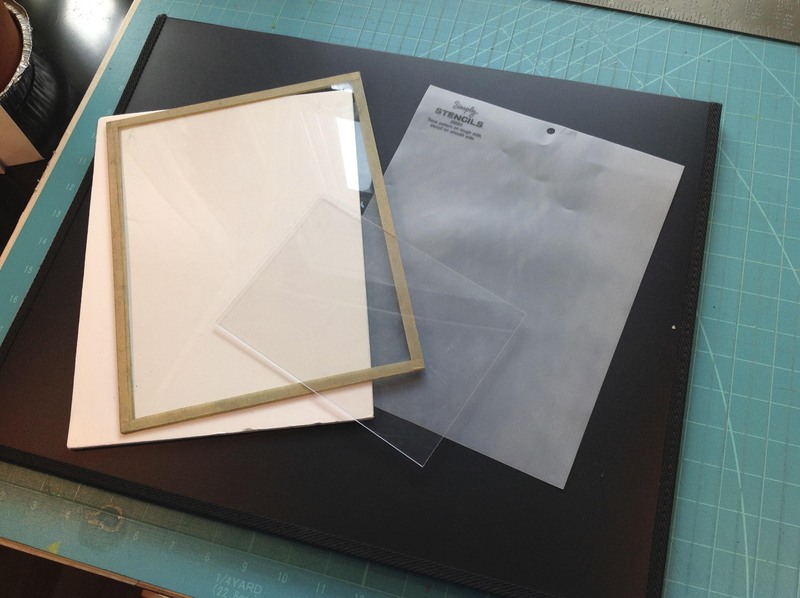 Some other materials that can be used for the plate: glass (with tape around the edges to keep from cutting myself), plexiglass, stencil plastic. These need gum arabic, as the mylar does. When you first start to paint, try doing some different sized lines and different thicknesses of paint to get the feel of what the marks make when they are printed. Not enough paint will dry up before you can transfer it (did I say you need to work fast? — and even faster on yupo than mylar). Too much paint will make unsightly blobs when it is squashed between the plate and the paper. The above image was drawn on the yupo on the right and transferred to the paper on the left. You can see that quite a bit was left on the yupo; in fact, using yupo, you get the bonus of two images that may both be keepers! I used a very thin brush above; the paint line was about half as wide as the finished printed line. 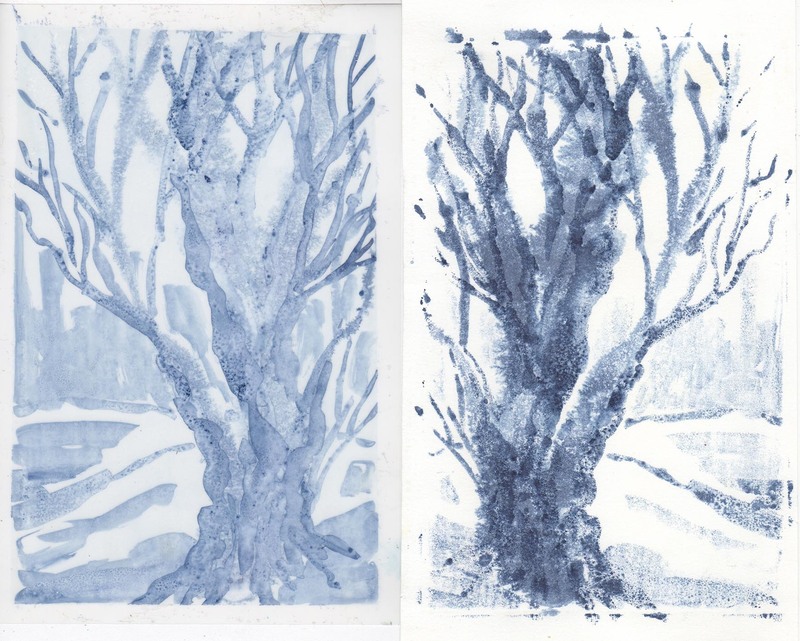 This print was made using a gum-arabic coated mylar plate (on the left). With the mylar, a lot more of the image transfers onto the paper. With this print, I kept going back and adding more and more branches and details on the trunk. I could only add a bit each time because i didn’t want it to dry in between. You can actually build up quite a lot of layers before the gum arabic gives out. A note about gum arabic; I use the kind sold in big bottles for printmaking, which has a deep amber tone. This can affect your paint colours, and also show up on the borders of your image. You can clean off the borders with a stiff paintbrush and some water, dabbing with a rag or paper towel if this happens, or simply mat or crop the image so the messy borders don’t show. If the dark colour concerns you, buy the (more expensive) kind sold for mixing with watercolours. Some people use a clear dish detergent like Ivory instead of gum arabic; I haven’t had as good results with that, but it’s worth a try if you want to experiment. Let it dry before painting on it, just like the gum arabic. When you’re done with your yupo or mylar plate, you can wipe them off and use them again and again! The yupo may pick up some stains from your staining pigments, but this won’t affect subsequent prints. And a couple more to get you inspired! 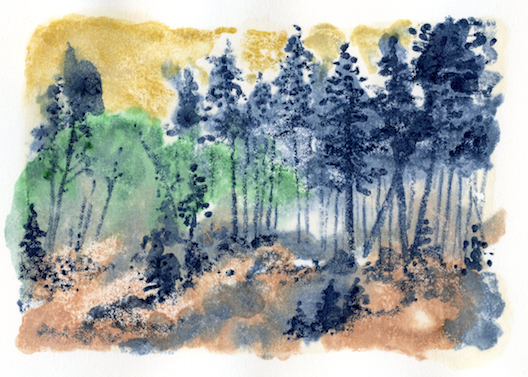 I hope you’ve enjoyed reading about my method of doing watercolour monoprints; if you have any questions, please leave a comment below and I’ll be happy to answer! ← Painting or Print? Both! Interesting, I feel like trying! Excellent! If you do, feel free to show off your results by putting a link here in the comments or sending me a message — I’d love to see! You were very thorough in your explanation! Thanks! Oh good! I always hope that someone can figure it out by reading what I wrote, but I’m always afraid I’ve left something out. I should have testers, like they do for recipes! Sorry to take so long to answer, Ernest — I missed this in the inbox! Let me know how it goes if you try it! 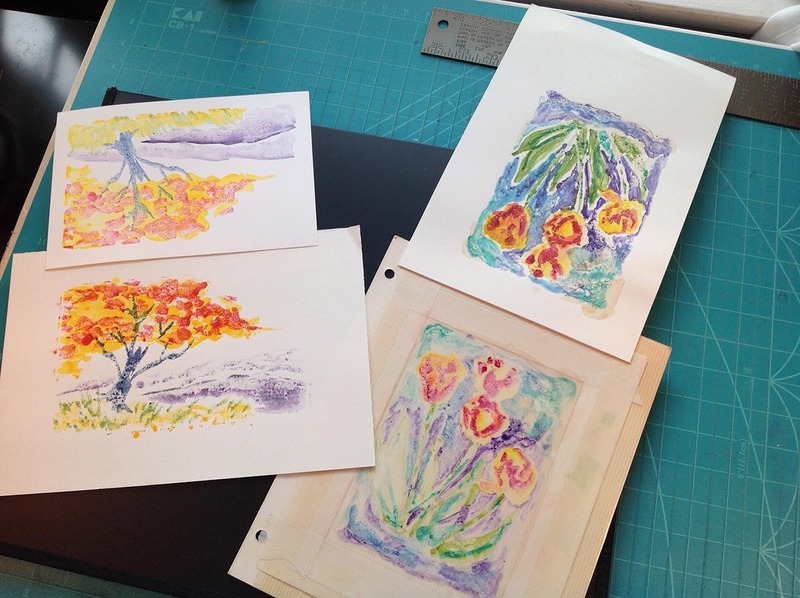 I came to your site because after working with oil based inks I thought I’d try watercolors for my monotypes. I was surprised to find that after working on my image over a 48hr. period I had difficulty getting it to release. The point of using watercolor was I was hoping to find a medium that I could work on over an extended period of time. I knew it would dry, but thought with damp paper it would release. Okay, so currently I’m trying a test strip of different brands of watercolor and gouache, letting it sit for 48hrs. and see. Oh and I included Dr. Martins liquid w/c using dish soap for now so it won’t bead. We’ll see. Hi Laura, thanks! Most people that I know who let the watercolour dry before printing use soaked, then blotted, paper and a press. It’s hard to get enough pressure without a press to do that technique. That’s why I generally work quickly and in stages, to transfer while the watercolour is still wet, because I don’t currently have access to a press. Let me know how your experiments come out! Thanks Karen. I too generally use a very small press, but I’ve been teaching monotypes here in New Mexico as a continuing education class and we don’t have a press. I’ve been trying to expose them to a variety of mediums, which brought me to watercolors. Thanks for your tips, I’ll keep you posted. That’s great, Laura! Best of luck — if you post any photos on social media, feel free to link it here — I’d love to see your results! 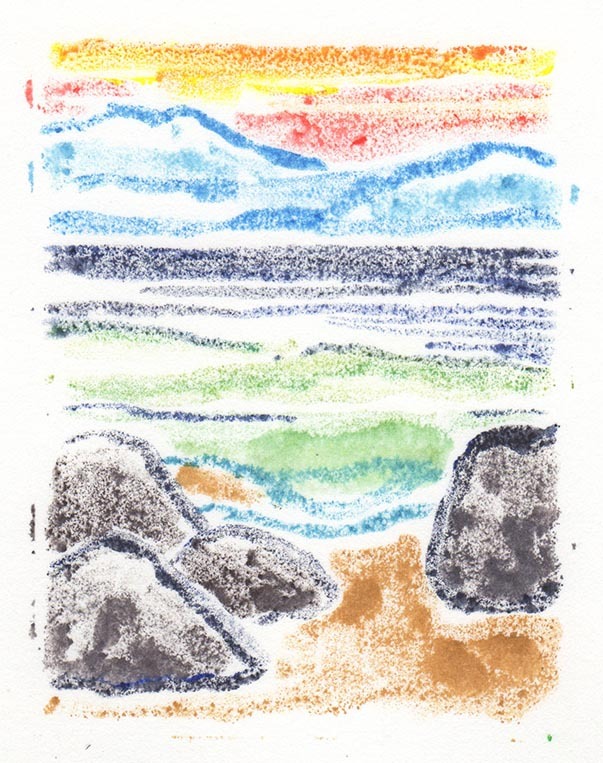 Hi there, I was looking for some artists who use water color when monotyping for my GCSE project, and your site has really helped! I hope you don’t mind, but I have used one of your prints as an example. Thanks again. Hi there! Glad to be of assistance! What is GCSE? No, I don’t mind, as long as attribution is given; a link-back to my site would be nice too. Very nice. Have not tried it yet. Been busy with other art techniques. I try everything. Will get to it. Thanks, Ernest! Yes, I know what you mean — so many techniques, so little time! Have fun when you do get to it!